We Did the "Heavy Lifting"
IMG Digital integrates systems, ensures the proper flow of information and develops the necessary marketing dashboards so our clients understand their marketing and sales operations. Let our experienced team ensure that you fully leverage your marketing platform(s), streamlining your marketing and sales processes. Our work will give you confidence in your data flow and ultimately, we will save your most scarce asset, your time. The following apps have been vetted extensively by our team and we regularly implement these apps for our clients. Each of the logos is clickable to the apps' respective website so take a look below and put our best practices into place! In the interest of transparency, IMG Digital receives commissions from several of the vendors listed below. Please click on any of the links below for additional information on these recommended apps. We often find opportunities across our clients' various departments including marketing, sales and operations. One of the main features we seek in marketing apps is connectivity with other platforms, especially API connectors like Zapier.com. App developers must be focused on integrations with others as much as they should on developing their capabilities. HubSpot's marketing automation enables users to automate email campaigns, customize and personalize messages, and tailor content to reach leads more effectively. Their powerful workflow tool can automate many tasks besides emails such as webhooks, lead scoring, adding tasks to your CRM, rotating leads, and more. SharpSpring helps drive and convert more leads by notifying sales professionals when the right time to act is. The platform allows you to build automated rules and send segmented and targeted content to leads based on their interests.The platform easily integrates with a variety of systems. Some of their features include campaign tracking, blog builder, dynamic landing pages, CRM & sales automation, behavior based emailing, and more. Constant Contact, an online marketing company, automates emails with contact segmentation based on user interaction and clicks. They provide email templates optimized for mobile, tablets, and computers. They handle all of the contact management such as unsubscribes and bounces. Infusionsoft focuses on receiving higher engagement by finding out who is visiting your website most frequently and automatically offering leads discounts or promotions. The software automatically emails users with abandoned carts. Their drag and drop campaign builder is easy to use and can send personalized communications to your contacts. Infusionsoft has a full CRM integration, tracks website views, and can build customize landing pages. Mailchimp has interactive templates for easy-to-create emails, landing pages, social media ads, forms, and more. The platform integrates with a variety of different systems and sends out automated communications based on users actions with your content. Abandoned cart emails, retargeting, and welcome messages are just the surface of their automated capabilities. Marketo, owned by Adobe, is a marketing platform that helps you build long lasting relationships with your customers. Their marketing automation featuresemail marketing, lead scoring and nurturing, ad targeting, mobile engagement, and a CRM integration. The software determines how your marketing campaigns impact your revenue so you can properly optimize your marketing strategies. 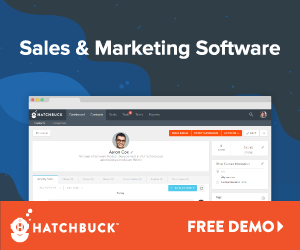 Hatchbuck has an easy to use CRM with sales and marketing automation, and email marketing capabilities. Their CRM constantly tracks and monitors your contacts' activity. Their marketing automation software personalizes and segments messages while prioritizing leads. The email builder is easy to navigate and provides reporting and tracking metrics. Zapier offers integration solutions to increase your productivity. The software connects different web applications you use and makes moving information from one system to another effortless and efficient. Simply link your applications by creating Zaps. Creating a Zap is simple, and Zapier walks you through the process step by step. Databox is a business analytics platform that shows your business' performance. Connect all of your apps and tools such to databox to pull in your performance data. Databox provides a single place for you to review all of your KPIs so that you can easily compare, contrast, and evaluate performance. Easily build different dashboards to visualize your data in your own customized way. The software can give you performance alerts when you are trending and gives you recommendations for improvement. Create a databox for yourself or for each individual client performance. Lucky Orange tracks and monitors where consumers go on your website. The heat maps they deliver help you modify areas of your site that are not getting conversions. The software also shows you how many active users are currently on your site and how they found it. In addition, the software has chat, customer feedback, form analytics, and conversion funnel capabilities. Canva is a graphic design website that allows you to create designs for social media, presentations, posters, flyers, business cards, and more. They use drag and drop system for an easy to use experience that required no design skills. The website provides over 1 million images to use during your creation process, along with templates and design tips. Powtoon is a software that makes creating animated presentations and explainer videos easy. They provide a variety of ready made templates, characters, backgrounds, sounds, and videos. You can also upload your own and create a video from scratch. You can easily upload your finished video to Facebook, Youtube, SlideShare, Vimeo, Wistia, HubSpot, and Facebook Ads Manager. Or you can download it as an MP4 or to PowerPoint. Drift is a conversational marketing program. They have chatbots that follow the inbound methodology and ask users qualifying questions to create leads directly in your CRM. Drift also has conversational landing pages that are personalized for each visitor's conversation. In addition to the chatbots and landing pages they have email capabilities for sales and marketing, account based marketing, and more. Slack is a communication tool that helps departments easily collaborate together. Slack provides organized conversations through different channels that can be divided up by project, team, or anything relevant to your business. Members in each channel can join or leave whenever they need to. It provides a fast and easy way to communicate throughout the office. It also has video call capabilities and file sharing. Their app directory has 1,500+ apps you can connect to Slack to easily integrate your tools. Sumo is an effective platform for building leads. Sumo has a variety of different tools for acquiring email addresses from leads. They have a welcome mat, list builder, and smart bar you can customize and place on any of your webpages along with share buttons you can add to any article. They have plugins for WordPress, Shopify, BigCommerce, Magento, and Google Tag Manager. HubSpot Lead Flows enables you to convert website visitors into quality leads. With this software you can create and customize lead capture forms. It is free and easy to use. You can build pop-up forms that convert without needing to know code or be a developer. Once you create a form the system automatically handles the rest. The platform allows you to see what forms and offers are receiving the most interest and conversions. Instapage allows you to quickly create landing pages that maximize your conversion rates. They provide customizable templates with examples. They also have a collection of images, fonts, and widgets to ensure you can create the right look for your brand. Their mobile optimized landing pages can be AMPed right in the platform. Aloe.ai provides an easy way to take and organize meeting notes. Aloe organizes all of your notes automatically. You can take a notes in a variety of different ways such as handwritten with the Aloe App, text Aloe, call Aloe for a word for word transcription, forward emails to Aloe, video chat with Aloe for a recording and transcription, and upload videos or photos to the app. The software can also upload your notes to Salesforce or HubSpot. PandaDoc is a document automation software for eSigning documents. The software creates, sends, and tracks the documents out to clients for electronic signatures. Customers can sign for free on their phones, laptops, or any other device. For group documents the software allows you to set signing orders and signing groups. You can customize and personalize your proposals and documents with text, images, and videos. Workzone is a project management software for businesses of all sizes and industries. The software allows you to track the status of tasks across departments or campaigns. Workzone has templates for for standardizing and simplifying your processes. It also has personalized to do lists and a resources for balancing work across your team. The platform helps you stay organized and on time. Egnyte is a file sharing platform the provides data protection and security. This SaaS solution stores files and data that can be shared to different users. The software is accessible through the cloud or on-premise repositories from any device. The platform allows you to organize your data and files in an easy way. You can even classify data as sensitive when it is stored and the software complies with regulatory data protection policies. DocSend is a content management platform that helps marketing and sales professionals keep their collateral in one place. Making it easy to find and update when needed. You can send and share your documents and presentations within DocSend. With DocSend you can even make edits once it's in your client's inbox! You can also present your presentations without downloading. GoDaddy domain registering and web hosting services are easy and affordable. GoDaddy is the biggest domain name registrar in the world and has over 18 million customers. They offer 24/7 support plus a variety of articles to help you along the way if you have any questions. GoDaddy gives tips on the domain registering process to ensure your website has the right domain for your business. Sucuri's platform offers a proactive defense against malware intrusions and offers variations of its product depending on your need. Blocking cyber criminals is difficult but Sucuri will ensure you're protecting your critical web assets from the most common intrusions. Sucuri is a cloud-based platform that is easy to use and requires only a simple installation process. Keep your passwords, credit cards, addresses, and sensitive information safe with LastPass. LastPass is a password manager and generator. your login credentials are stored in a secure online vault. When you are logged into your LastPass account your login credentials for websites show up automatically in the website, making remembering usernames and passwords easy. G Suite is a cloud-based productivity suite that helps teams communicate, collaborate and get things done from anywhere and on any device. Check email, share files, edit documents, hold video meetings and more whether you’re at work, at home or in transit. Business email you@yourcompanydomain.com -- Looking professional matters! Anonymously secure your internet connection with HMA! Pro VPN - connect to our VPN service to anonymously encrypt your internet activity from prying eyes. All applications on your computer that utilize your internet connection will become anonymous with just a click of a button; no technical experience is required due to our easy to use VPN software.